A. 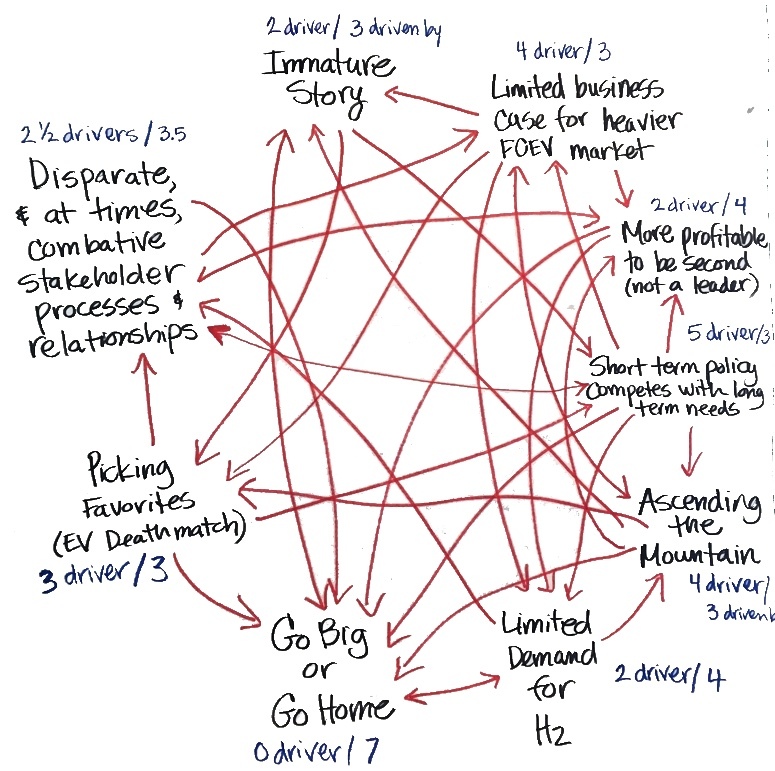 How do you help a group establish priorities without creating winners and losers? ToP methods are based on the principles of inclusive participation and profound respect. Honoring these principles requires participants' ideas have the opportunity to be heard and understood. People who feel heard are far more likely to stay engaged. Engagement is critical for building healthy communities. There can be too many ideas for a group to manage and establishing priorities is often necessary. Session 5 explored five priority setting tools designed to support robust conversation and group agreement on setting priorities. A key consideration for all five tools is to begin with a discrete list of options that the group understands. Discrete means the items on the list are sufficiently different to minimize the risk of split voting. A discrete list could be the results of a consensus workshop, for instance. However the list is created, provide the opportunity at the beginning for questions of clarity about the options. You might even provide the opportunity for those who champion particular options to give a brief statement in support of the idea in advance of the prioritization process. B. What are some quick and easy priority setting tools? The facilitator scans the audience and marks by the item the priority (high, medium high, medium, medium low, low) and moves to the next item. 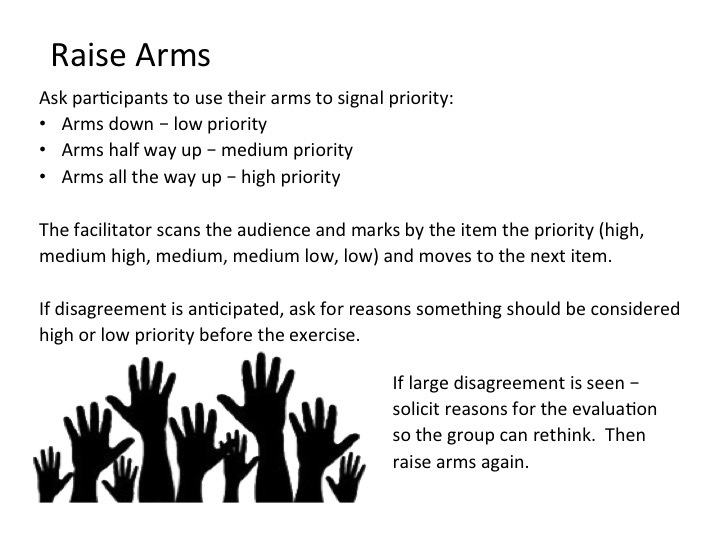 If disagreement is anticipated, ask for reasons something should be considered high or low priority before the exercise. If large disagreement is seen – solicit reasons for the evaluation so the group can rethink. Then raise arms again. Begin with list of discrete items (e.g., CW titles) and review items with group to assure they understand the items. Provide opportunity to participants to advocate for items they are enthusiastic about. C. What if options are more complicated and there are many things to consider? Green for items that are the easiest to implement. 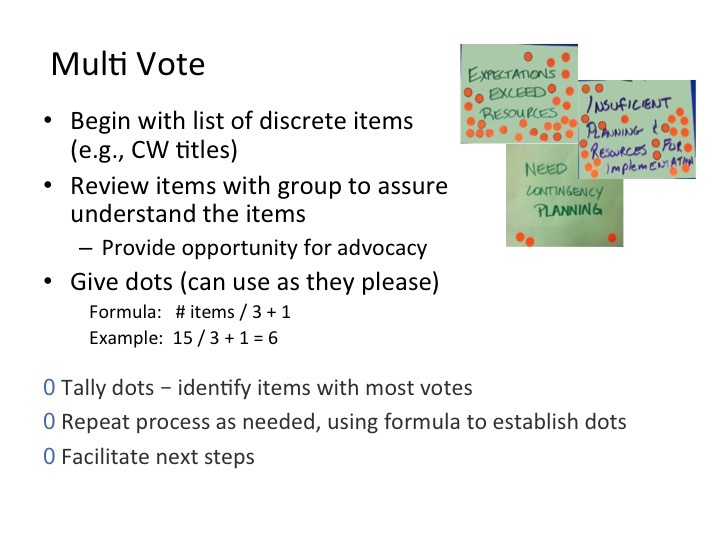 Determine number of each color dots per person using Multi Vote formula and invite participants to place their dots on the items of their choice. Count the dots and report back to the group. Discuss the information revealed by the criteria based multi vote and determine which items will be moved to the next level of strategy development. This method can be used for reflection and information gathering, in addition to priority setting. 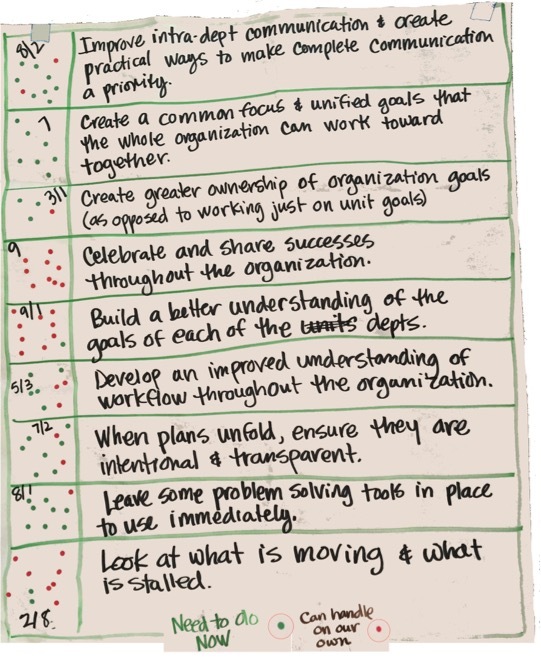 D. What are some priority setting tools that bring a strategic focus? Rate each item on that item's level of impact (high or low) and effort required (easy or difficult). Create 2 x 2 matrix. The vertical axis is level of impact - low on the bottom and high at the top. The horizontal axis is level of effort - easy is on the left and difficult on the right. 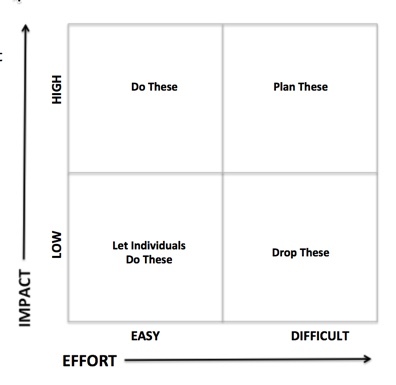 Place items on a 2 x 2 matrix according to their level of impact and difficulty. High impact - easy to do items get priority. High impact - difficult to do items can be assigned to teams. Low impact - easy to do items can be done by someone who really wants to do this item. Low impact - difficult to do items should be dropped. The Interrelationship Diagraph is particularly useful with a discrete list of problems, contradictions or blocks that are clear to the group. If yes, ask: “Which is the driver?” Draw a line starting with the issue that is the driver to the issue it drives (the arrow start at the driver and point to what it drives. Compare item 1 to item 3, then item 1 to item 4….. Until you have progressed all the way around. Compare item 2 to item 3, then item 2 to item 4 all the way around, asking the two questions and drawing arrows. Compare Item 3 to 4, 4 to 5, etc., all the way around, repeating process until every item has been reviewed. Count the number of times an item was the driver and the number it was impacted by a driver. Tally both counts. The items that drive (impact) the greater number of other items should be given priority to gain the most improvement.